When I was a little 'un, I thought the Rat Patrol was the bees' knees. 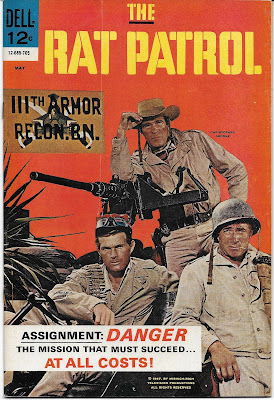 Running on ABC for two seasons starting in 1966, it featured a commando team in WWII North Africa, riding around in a pair of jeeps equipped with .50 caliber machine guns and causing havoc among the Germans. It looked awesome. Heck, it still looks awesome. Also, a kid's level novelization of the show was one of my favorite books--one that still held up when I found it and re-read it as an adult. 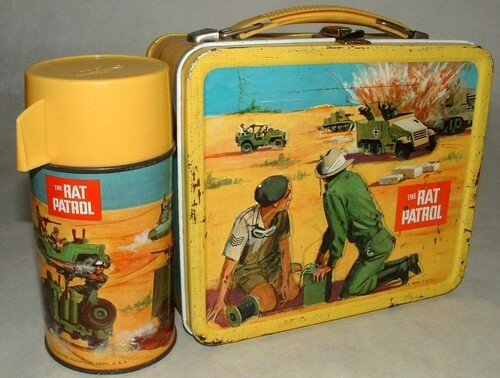 Also, the Rat Patrol lunchbox is unquestionable the coolest lunchbox ever. 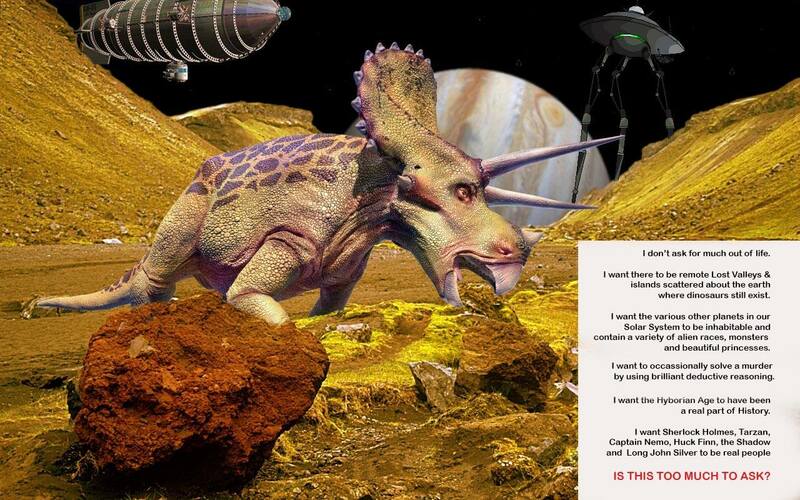 I would betray mankind to invading aliens for a chance to own this again. As an adult, I do recognize that the half-hour episodes occasionally suffer from poor plot construction, but it's still visually appealing and Eric Braeden was excellent as the clever Africa Korps officer who clashed with the Rat Patrol in most episodes. 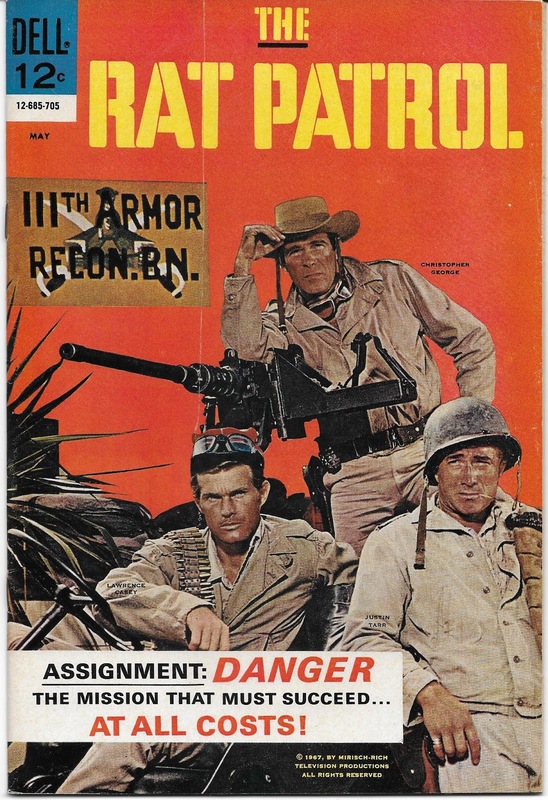 Dell Comics did a five issue series based on the show in 1967 which was also pretty good. The third issue (May 1967), for instance, includes a fun yarn titled "The Day the Tables were Turned." The writer is unidentified and the art is by Jose Delbo. The two-car convoy with the general will pass by in the morning, so the Patrol beds down for the night, leaving Hitch--one of the drivers--on guard. 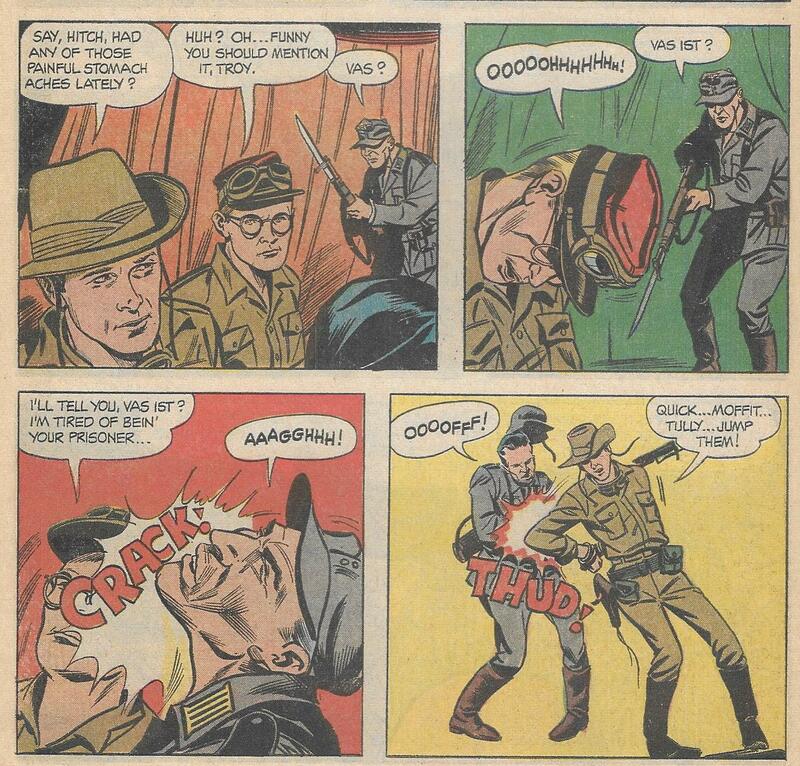 But Hitch, though he's a seasoned veteran, gets a little careless during the quiet night and is jumped by Germans. Because he's unable to give a warning, the rest of the Patrol is quickly captured as well. 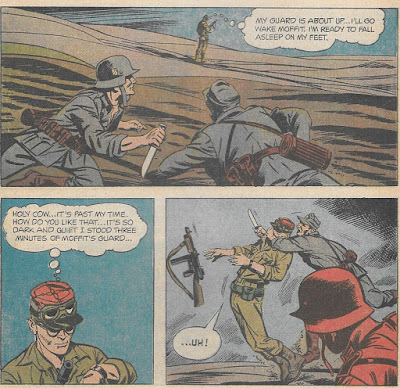 A German officer named Schmidt has a plan. He and three of his men will dress in American uniforms and use the Rat Patrol's jeep to ambush the convoy and rescue the general. Schmidt, in the tradition of generals everywhere, politely explains this to Troy and his men before sending them back to a German encampment. For the most part, this is a pretty well-constructed story, but the cliche of the villain explaining his plan is an unnecessary one. 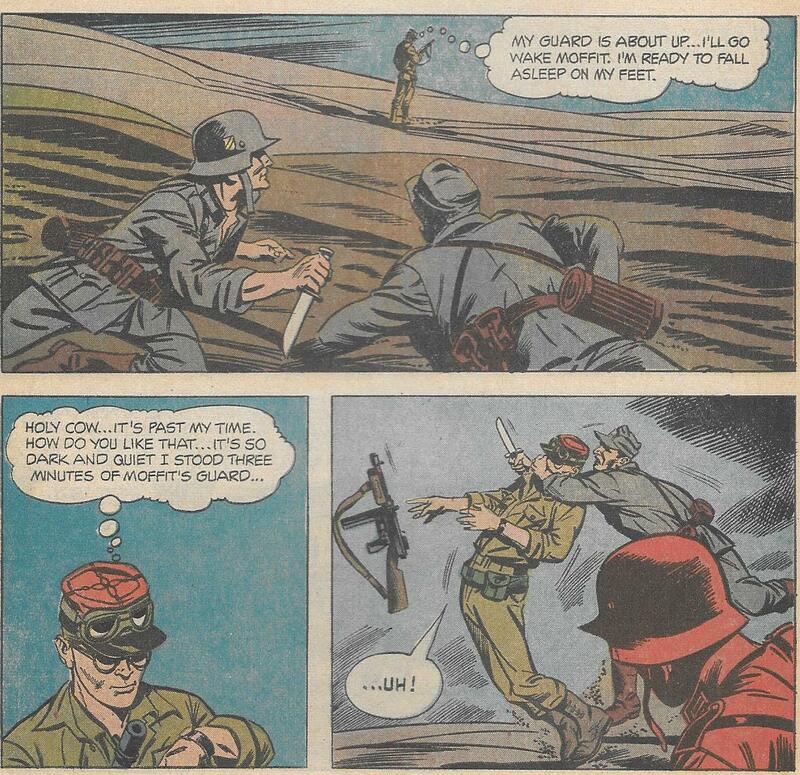 When Troy saw Germans in American uniforms, he could have figured it out for himself. Though to be fair, we'll soon see that Schimdt is a bit nuts, so he probably has the villainous personality type that makes him want to gloat. This leads to the Rat Patrol using the tank to fight their own jeeps. 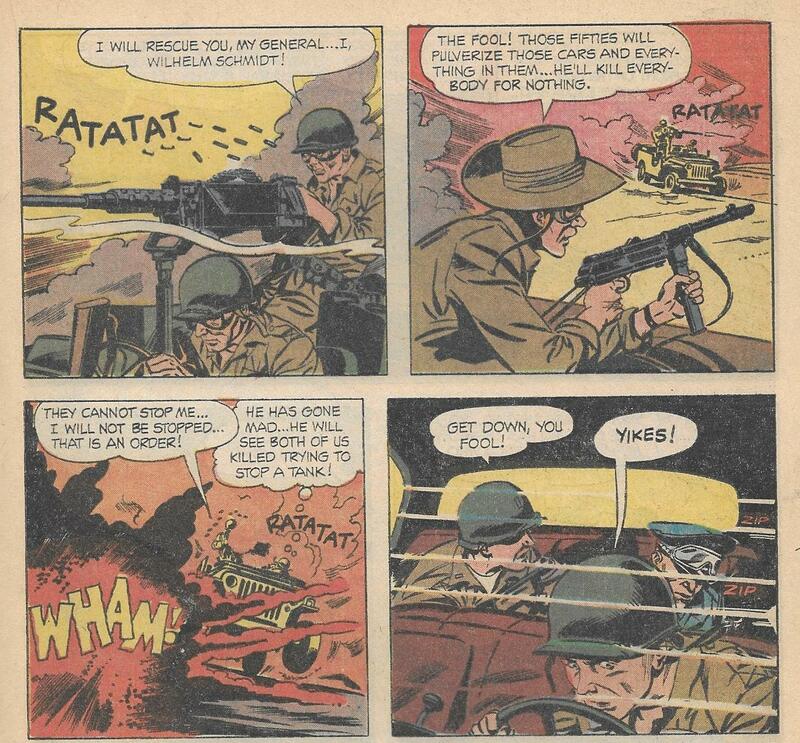 I really like the above panel, by the way, especially the touch of having the ejected cartridges from the machine gun zip out directly towards the reader. It gives the image a real sense of kinetic energy. 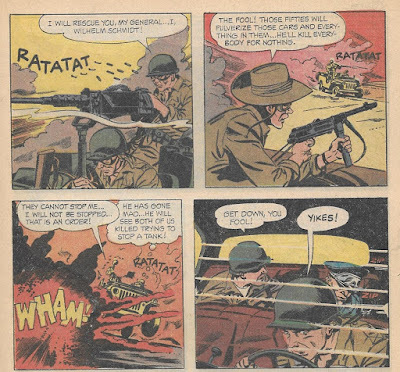 Anyway, tank vs. jeeps isn't that fair a fight for the jeeps--though the Rat Patrol actually does that sort of thing all the time. One of the Germans even mentions this and adds "Maybe it is not so dangerous!" Well, it is dangerous. Schmidt goes off his rocker during the fight and nearly kills the general he's trying to capture, but the jeeps are knocked out with cannon fire and the Germans captured. It's interesting that there's no body count in the story. It would be interesting to know whether this was an editorial decision to tone down the violence or just the way the story flowed when the writer was putting it together. As I mentioned above, aside from Schmidt's cliched gloating, this is a fast-paced and well-constructed story. Despite it's flaws, The Rat Patrol is a fun show and its nice to know that the comic book adaptation did it justice. In fact, I think we'll return to this comic in a few weeks to look at the other story in it. Next week, though, we'll sail with Moby Duck and Donald Duck as they clash with Captain Hook. The Whole Town is Dead!